1869 (1875 Re-issue), 15¢ brown & blue, type III, light oval cancel, well centered with rich deep colors, Very Fine and attractive; with 2000 P.F. certificate. 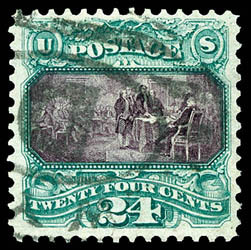 1869 (1875 Re-issue), 24¢ green & violet, New York station "D" oval cancel, choice centering amid well balanced margins, rich vibrant colors, Extremely Fine; with 1989 P.F. certificate. 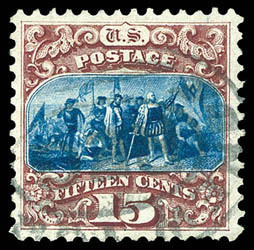 AN ATTRACTIVE USED EXAMPLE OF THE 24¢ PICTORIAL RE-ISSUE. 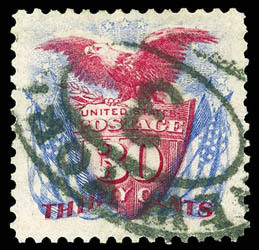 1869 (1875 Re-issue), 30¢ ultramarine & carmine, rich deep colors, nicely centered amid wide margins, New York "3" oval cancel, Very Fine and choice; with 1983 & 2011 P.S.E. certificates. 1869 (1880 Re-issue), 1¢ buff, horizontal pair, tied by "New York Mar. 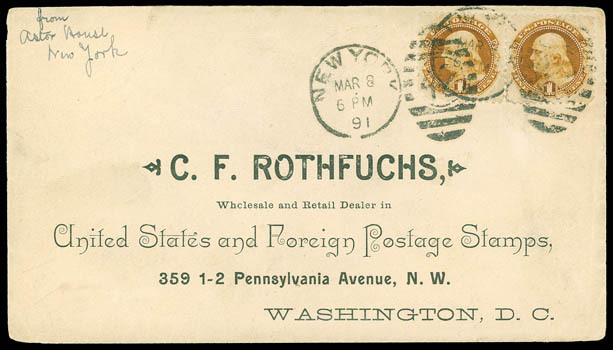 8 6 PM 91" duplex with "42" barred ovals on cover with printed address to stamp dealer C. F. Rothfuchs in Washington D.C., manuscript "from Astor House New York" return address, Washington D.C. (3.9) receiving backstamp, Very Fine and attractive, ex-Coulter; with 1977 P.F. certificate. Scott No. 133 Estimate $1,000 - 1,500.